Size of this preview: 483 × 600 pixels. Other resolutions: 193 × 240 pixels. 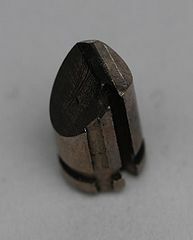 The chisel of a Medeco Biaxial pin, used to rotate the pin properly. The pin also shows forensic evidence of lockpicking tools. This page was last modified on 13 July 2009, at 13:22.